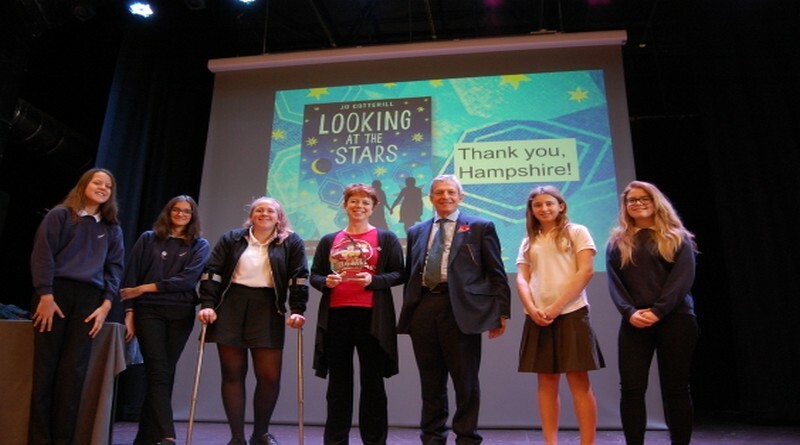 Hundreds of Hampshire school pupils have met author Jo Cotterill at Winchester Guildhall where she was presented with the Hampshire Book Award 2016 for her novel Looking at the Stars. The annual award held this week, and organised by Hampshire County Council’s School Library Service, is presented for the best paperback fiction book published each year for 11-13 year olds. The event aims to highlight the most rewarding and accessible fiction for the age group, and challenge students to critically assess what they read. The Hampshire Book Award prides itself on not only encouraging children to enjoy reading and to unlock their imaginations, but also to analyse their thoughts and choices along the way. At the very heart of Jo’s book is a character called Amina who tells stories about the stars she can see in the night sky. It’s fantastic to see that Amina’s love of storytelling has jumped off the pages to spark the imagination of nearly 500 Hampshire children who voted for the book as their top choice. 49 Hampshire secondary schools were involved in choosing the winner, with this year’s judges reading and evaluating six shortlisted titles over 12 weeks. The final judging took place at six Hampshire venues in June and was a chance for schools to discuss the shortlist. Once votes were cast, Jo Cotterill’s Looking at the Stars was revealed as the winner via a ‘simultaneous broadcast’, having been voted top by five of the six venues. As part of the award ceremony on Wednesday 2 November, schoolchildren had the chance to meet Jo Cotterill, have copies of her books signed and receive activity goodie bags. Looking at the Stars is a very special book for me. It’s the first time I’ve written something that expresses a deeply-held personal belief, and to know that the message within – that imagination gives you power – has resonated with so many children is very humbling. I’m utterly thrilled to have won this wonderful award, and I’d like to thank everyone involved, from the teachers and librarians to the children who have read and voted on the books.